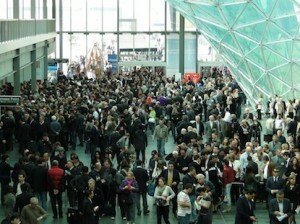 Get ready for Eurocucina 2012! Next month (April) will be the 51st anniversary of Saloni (Tuesday, April 17th., to Sunday, April 22nd.) 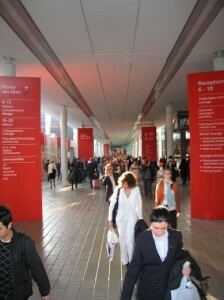 – the largest and most important Furniture fair in the world. 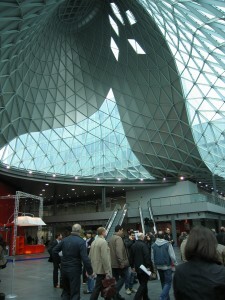 Every other year, as part of Saloni show, a portion of the fair is dedicated to Eurocucina – the largest and most important kitchen show (also bath and appliances) in the world. This will be the 19th. time Eurocucina is taking place and the 2nd. time it is joined by FTK – the Technology in The Kitchen section, with new technology, appliances and such. Our sources are telling us that several brands, such as Poggenpohl and Pedini, to name a few, have pulled out of the show and are doing something else this year. Poggenpohl chose to attend KBIS (Kitchen & Bath Industry Show) in the US and Pedini are having an In-House Fair instead, celebrating the grand opening of their new showroom in the factory. Times: from 9.30am to 6.30pm. Open to sectoral operators only. Saturday 21st and Sunday 22nd April open to the public. Salone Satellite: open to the public every day during the trade show from 9.30am to 6.30pm. Free entry. Products on exhibit: plastic laminate kitchens, wood kitchens, metal kitchens, lacquered kitchens, brick kitchens, furnishing accessories for kitchens. Associations and sectoral bodies, newspapers, magazines and sectorial publications. If I lived in Europe, this is where I’d be next month. I do have some questions for you though, so If you wouldn’t mind getting back to me, I would really appreciate it. Feel free to ask, John.